The last runs to an amazing ski season are upon us as we move into spring. As the days get longer and the temperatures hopefully get warmer, the SNHA Regime and Homeowner project calendar is quite active. We have a new homeowner offer to make you aware of and would like to share the current Regime plans. Please remember that the spring season is short so plan early and we look forward to assisting you in the process. When sending in your homeowner calendars for the summer season, don’t forget to save the date of Saturday July 6, 2019 for the Annual Meeting and picnic. Details and agenda will be available closer to the date. Are you looking to replace your appliances? Look no further than the Super Store of Williston VT! Kimberly Lasnier Kimberly.Lasnier@superstorevt.com will shop spring appliance deals for you and take an additional 5% off of all new major appliances for SNHA homeowners. Project details and deliveries will be coordinated through Tracy tracy@snha.net in the SNHA office. Don’t miss out as this offer only runs through May 31, 2019. Creekside – Plans are being formulated by Directors for routine schedule of work. Hakone – New gutters for the road side, and an evaluation of the condition of slider doors – H 15,19, and 23 had unanticipated replacements in November-December when failure was discovered in late fall. Directors are evaluating the other homes and 33 sliders and windows and will have more details and a plan when spring arrives. The Hakone sliders and windows are original and have reached age 40 years. Liftside – The rear exterior walls and gable ends will be painted. Touch-ups on the decks will also be included. Entry roof shingles will be assessed for repair and routine interior touch up will be performed. Mountainview 1-20 – Driveway and areas in the entry courtyards will be regraded to improve drainage of surface water to run away from the building. Siding repairs and painting will be evaluated and completed as needed. Nordland – New entrance double doors will be installed, adjustments to the new interior hallway doors installed in 2018 will be made to address noise from door closing, and any outstanding punch list items will be completed from last year’s hallway improvements. Poolside – A plan for addressing the concrete entry porches and walkways – damage and deterioration in the works by the Directors. New LP Gas meters will be installed in a new location on the gable ends with screening added for visual and security purposes. Riverside 37-48 – Drainage issues on the front entries will be evaluated and addressed, new entry doors and trash closet doors will be installed, a plan for new hallway heaters and controls is under consideration, and the west gable wall will be reviewed as to current condition and siding replacement to be scheduled. Riverside 49-60 – Drainage issues on the front entries will be evaluated and addressed, new entry doors and trash closet doors will be installed, bike racks will be installed at each end of the building, and a plan for additional work in the hallways is under consideration. Slopeside – New ski lockers will be installed for the lower level homes to complete the hallway improvement project started in 2017. Exterior siding will be cleaned, and wood surfaces painted with repairs to wood trim as needed. Telemark – A plan for addressing the failed planting borders and asphalt walkways is underway. Trailside Executives 1-12 – Routine annual work as previously scheduled. Roofs will be evaluated as we approach the planned target year for replacement of roof shingles. Status and details will be reported to homeowners and recommendations will be set forth. Exterior siding will also be reviewed for a status report on condition. Villmarksauna – New hallway heaters and controls are being installed, new sconce lighting for the entry sections has been installed, new roof shingles for building VS units 16-24 will be installed, and hallway walls and lighting are being evaluated in stairways and upper levels with a plan to be completed to continue the improvements begun in the entries with the new entry doors, ski lockers and wall painting. All Regimes – Full owner homes – Smugglers’ is considering an upgrade to existing WiFi infrastructure that supports the wireless access to the Internet. SNHA is awaiting the details and schedule for these upgrade activities. Access to locked closets and areas for existing equipment locations will be required. Stay tuned for more information. Your cooperation to provide access will be required and appreciated for any upgrades to be accomplished. Every effort is being made to accomplish the above work during the Smugglers’ schedule for the blocking of homes from guest use during the Spring. Other special block periods will be published as they are set. *To find an archived article, select the month, and a summary will appear on the home page. Click on the summary title to bring up the complete article. 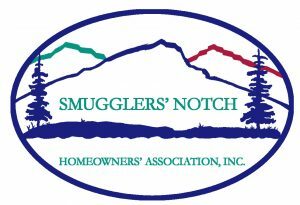 © 2018 Smugglers Notch Homeowners Association, Inc.